This creamy mushroom pasta is the ultimate 'I don't want to cook' dish! It's ready in only 20 minutes, is packed with goodness and is utterly delicious. Vegan, healthy & GF. Bring a large pan of salted water to the boil and add your pasta. Cook according to the package directions then drain, reserving a little of the pasta water. Meanwhile make your sauce. Heat the olive oil in a frying pan over a low/medium heat and add the garlic, mushrooms, thyme and 1/2 tsp of sea salt. Cook for 10 minutes stirring occasionally until the mushrooms brown and are tender. Add the spinach into the pan and stir for a minute or so until wilted. Remove the pan from the heat. Stir the yoghurt and most of the parsley into the mushroom mixture, allowing the residual heat to loosen and warm the yoghurt. Season liberally with black pepper and taste to adjust the salt. Add in the drained pasta and give everything a good mix. If you prefer your sauce a little thinner here, add a few tablespoons of the reserved pasta water and mix again. To serve, divide the pasta between bowls and top with a sprinkle more of parsley and lots of cracked black pepper. Enjoy whilst still piping hot. Once cooled leftovers can be stored in the fridge for up to 3 days and reheated over the stove with a dash of water. This recipe doubles or triples perfectly if you are cooking for a crowd! Gluten-free: Assure that you use a gluten-free pasta. Vegan: Use a dairy-free yoghurt. 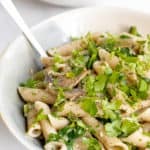 I particularly love brown rice pasta for this recipe as it is naturally gluten-free and gives a wonderful nutty flavour. You can use any pasta you prefer. I use coconut yoghurt for this recipe but you could also use soya, almond or cashew milk yoghurt. If you aren't dairy-free greek/natural yoghurt also works well.